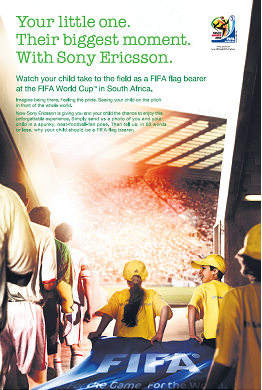 This June, one Singaporean child will win a once-in-a-lifetime opportunity to take to the field at the 2010 FIFA World Cup™ in South Africa! Sony Ericsson is launching a search for a Singapore representative to hold the FIFA flag up high at a FIFA World Cup™ match - and the winner’s parent gets to go along as chaperon. If the love for football runs in your family, here’s your chance to share a truly unique experience with your child. From now till 7 April 2010, simply send a fun photo of you and your child demonstrating that shared passion for football and tell us in 50 words or less why your child deserves to be a FIFA flag bearer. You could be on your way to witness that special moment of seeing your child on the pitch in front of the entire world! 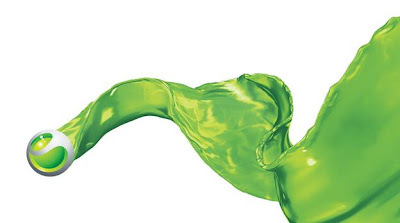 The most creative entry will win the Grand Prize of a pair of return economy class tickets to South Africa, 3N accommodation, return airport transfers and of course, the chance to be a FIFA flag bearer and to watch the England versus Algeria FIFA World Cup™ match ‘live’ on 19 June 2010. Ten consolation prizes of Sony Ericsson caps and footballs will also be selected. To participate, email your entry to mkgstpromo@sph.com.sg with the Subject: FIFA Flag Bearer. Please include your name, NRIC, address, age, occupation, contact numbers, your child’s name, date of birth and birth certificate number. The closing date is 7 April 2010. The competition is open to all Singapore citizens and permanent residents and the child entered must be between 10 to 16 years of age. Please refer below for all terms & conditions. Only Singapore citizens and permanent residents are eligible to participate. Staff and immediate family members of SPH and Sony Ericsson are not eligible to participate. The child must not be younger than 10 years of age or older than 16 years of age as of 19 June 2010. The photo (JPG format) should not exceed 2MB. Each child-parent is only allowed one entry. All winning entries will be uploaded on www.facebook.com/sonyericssonsingapore (personal particulars will not be revealed). Winners will be picked by a panel of judges and their decision is final; they will be notified by 9 April 2010 and must agree to publicity. The grand prize winner must be able to travel with a parent or guardian from 15 to 20 June 2010. If winner is unable to travel within this period, there will be no compensation and another winner will be selected. The grand prizes excludes incidentals during the overseas trip. The organisers’ reserve the right to replace the grand prize with an alternative prize of equivalent value.